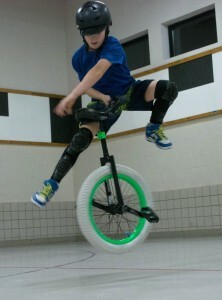 The Twin Cities Unicycle Club (TCUC) is the largest and oldest unicycle club in Minnesota with over 200 unicyclists. Membership is open to anyone who shares the interest of unicycling. If you are interested in joining, please come check out one of our Classes and Practices!. For a current schedule with practice and class times and locations, see our Calendar. 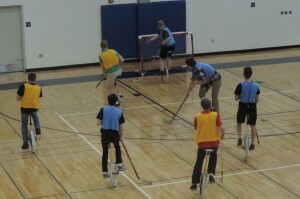 The Club practices unicycling year round, at various locations and times around the Twin Cities. 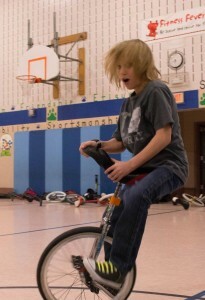 Practices include a variety of activities, such as individual learning, group riding, unicycle hockey and basketball, juggling, unicycle racing and more. 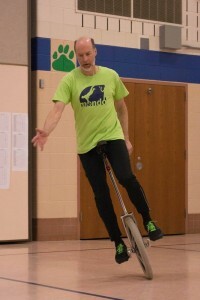 Unicycles are provided for newcomers, so check out the calendar for upcoming dates and locations. 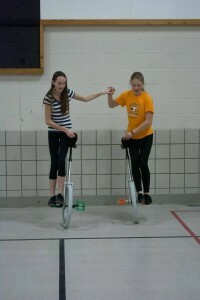 Unicycling is a great way to improve physical fitness, balance and coordination. It’s fun for all ages, and offers a lifetime of challenges and friendships. TCUC offers a welcoming atmosphere with riders of all skill levels to provide advice and encouragement to new riders and old. TCUC has some of the best riders in the world. They hold over 30 national titles and 15 world titles in events like artistic, street, racing and Muni (mountain unicycling). We love showcasing these talents, so if you’re interested in a live performance, contact us for information on parades and shows.